A week or two ago, we were tricked into thinking that Autumn was on its way. The lows were dipping into the 50s, and we started to get chilly at night, sleeping with our windows open. We even broke out a quilt, still packed away from last winter. I know. We were fooled. It’s now quite toasty again and last night, even with the fan, it never really cooled off upstairs. But the quilt is still on the bed, because we refuse to acknowledge that it’s late September and rather unpleasant outside. Every morning, we pull up our covers (yes, Mom, we do), and we spend a few seconds musing about our quilt. Every evening, as we get ready for bed, we spend a few more seconds musing about it. When I happen to wander through the room at other moments during a given day, I muse. What the heck could we be musing about? This quilt is an artifact of community. My students are writing about communities for their second papers, and they have to select an “artifact” of the community as a way of analyzing the community’s values, so I’ve been thinking in terms of artifacts a lot lately. It’s the quilt my mom put together after our wedding. She cut out large 12×12 pieces of material before the wedding and then set up a table at the reception where guests could write us a message with fabric markers. Then she turned it into a quilt, a big one, big enough to cover our king-sized bed. But it’s an interesting artifact for reasons other than the particular, often quirky messages we reread to each other each day. As the years go by, I imagine it will become even more dear. Already it is a witness to people who have passed out of our lives, especially family members who have gotten ill and died, but also friends we haven’t spoken to in years. With sadness, we look at it and mourn broken relationships, yet we also see it as an account of joy, a celebration of new births and recent marriages, as we notice who is missing from the quilt. It is an account of our history up until June 19, 2004, a smattering of different nicknames, different groups of friends, different churches, close family members, long-far-off family members I couldn’t pick out of a crowd. Of particular significance is the medium of the message, the more I think about it. These messages are on a quilt, which is not just an artifact, really. It’s a blanket, a comfort-er. It keeps us warm when we’re chilly. And thanks to you, community, for the warmth you give us. My Pappy Sands passed away on Sunday night, January 27th. Alzheimers had slowly been stealing him from us for more than a year, but his sudden, rapid decline in recent days caught us by surprise. At Christmas, his family had gathered around him to sing carols together–and he sang along, knowing the words. In fact, when I greeted him in December, he kidded with me about wanting to call me Betty. Maybe it was confusion. Or maybe he was cracking jokes. Either way, he was in good spirits. Pappy Sands and Grandma Bev, his wife, owned a campground in New Hampshire. Throughout my childhood, we often drove the nine-hour trip north through the night to visit in the summer, especially over my birthday, the day before Independence Day. Flipping through his old photo albums, there were an inordinate number of me opening birthday presents year after year after year. 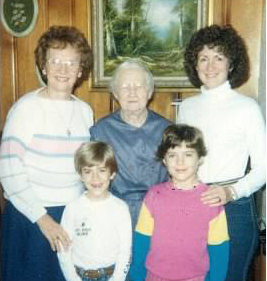 Pappy and Grandma were snowbirds in the winter, and eventually retired to Florida. We frequently drove south to Florida–again through the night–to celebrate the Christmas holiday in the warmer weather. So yes, lots of pictures of those Christmases, too. One year, for some unknown reason, I had a Christmas sticker on my forehead in every single photo. Why I put it there in the first place, I don’t know. Why nobody insisted I remove it after the first few photos, I really don’t know. 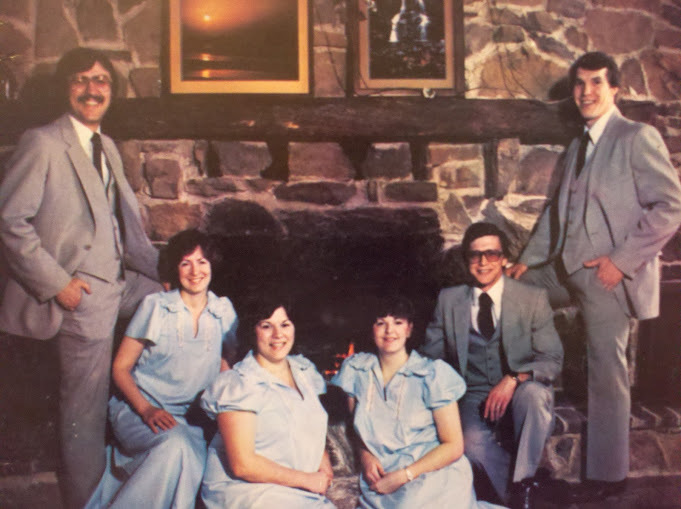 Some time around 1979, my dad, mom, and my dad’s sisters and their spouses formed a gospel singing group called The Family Circle. Lugging around their sound equipment and matching outfits, they sang to gospel music cassettes at assorted church events on the weekends. I came along in 1982. By the time I was four or five, I had my own song, called My Mommy Told Me Something. I don’t remember singing it, to be honest, and at least in the one video recording I saw of myself flanked by my cousins in front of a church, I mostly stood there mute and stared at the congregation, microphone in hand. My memories of time on the bus are a ragtag collection of snippets: Uncle Larry microwaving Lebanon balogna sandwiches, the teasing over Coke versus Pepsi, learning the “Fifty-Nifty United States” song when travelling during the school year, lots of sunburned shoulders, getting foot massages from Aunt Diana (a reflexologist), watching Top Gun in the back bedroom, sleeping on the bottom bunk on the right side across from my cousin Justin, the youngest of the group. And, of course, all the singing. This may sound silly, but it was not until college–actually, at my now-husband’s family’s home over breaks–that I was first exposed to the concept of the daily newspaper. Yesterday was my momma’s birthday, which was another one of the year’s milestones in the family. In honor of her, and this wonderful day dedicated to mommas everywhere, here’s another list. -- How to sing harmony. where you don't want it to be. -- "Just ignore him, Elizabeth." -- Always wipe the counters. -- Wash the dishes as you go. -- Hospitals throw away a lot of perfectly useful things. -- It is okay to take a nap. -- Fresh herbs make a big difference. -- Call your mom on Saturdays. In honor of him, here’s a post that has pretty much nothing to do with community. But I hope you’ll join with me in wishing him a Happy “Nixtieth” Birthday. down trees in the woods by yourself. - Do not call anyone after 9 pm. me look stupid, not him. the bin of Little Debbie snacks. waitress is being Christ to her. - Why, yes, you can reheat coffee in the microwave. calendar, well, you might want to just skip on over this one. I grew up in a world where God talked to us. What I mean is, I grew up in a world that actually talked about God talking to us. Sure, I was never one of those folks who heard an audible voice from heaven, but I really did “hear” God’s voice through the Scriptures on more than one occasion, and I still do believe in nudgings from the still, small voice of God. I think it’s fair to say that I don’t live in that world any more, but since my pastor reads this blog as do a handful of other folks from my church, I’ll leave it up to them to correct me. Regardless, it doesn’t seem to me that I hear very many people in my faith community talking about listening in any tangible sense for God’s voice–and actually hearing something worth communicating. That’s not a slam, by any means. There are lots of ways to believe, to pursue, and to seek God’s wisdom in this life, and my denomination certainly loves Jesus and does a great deal of good in the world by sharing the gospel message. I’m just not used to hearing messages about God talking to me. But, crazy as this might sound to some of you, I still believe it. And I think most of my church friends believe it, too, even if they don’t say it out loud very often. So I decided to say it today, Ash Wednesday.